Frothed milk is the silky, creamy foam that accentuates the texture of your beverage, while steamed milk adds a bit of natural sweetness to take the bitter edge off your espresso-based drinks. Making espresso drinks like lattes and cappuccinos just isn’t the same without a milk frother or steamer. Without it, your drinks are going to fall flat, and you can forget making latte art. In this guide, we'll help you pick the best milk frother and steamer so that you can take your coffee game to the next level. 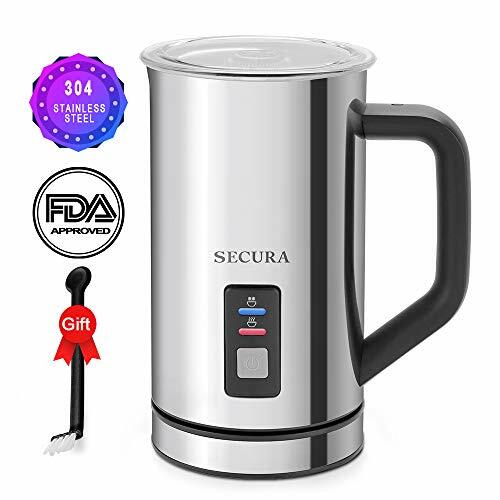 Best Electric Milk Frother – The Secura Automatic Electric Milk Frother and Warmer covers all the bases for frothing and heating milk for most coffee and espresso drinks. Best Handheld Milk Frother - Aerolatte Original Frother isn’t automatic, but gives you more manual control over your froth and heat. 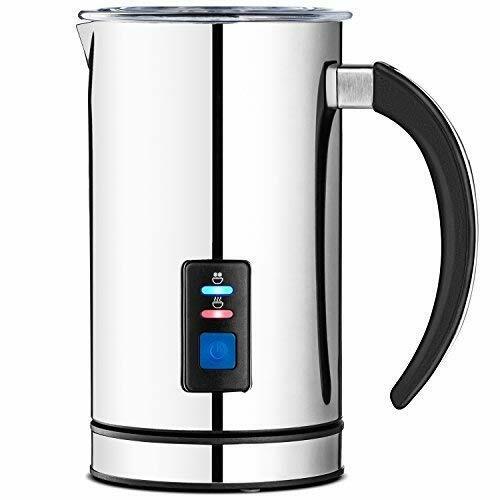 We have chosen 11 milk frother and steamer options in our milk frother reviews for you to check out before you buy. But before we get to our reviews, you should consider the differences between three main types of milk frothers and steamers for creating and cappuccinos, lattes, and other espresso-based drinks. What is a milk frother and what does it do? Here are the 3 types available for home use. A steam wand style frother works by injecting hot air directly into the milk. You'll see these on the best espresso machines. They're like an upside-down straw that pushes out hot air. They can take a bit of practice to use: you need good tip placement and temperature control to properly produce foam. They introduce heat as you use them, meaning that temperature control can be a bit limited. These work very quickly, taking as little as thirty seconds to produce enough froth for one drink. A hand-held wand frother works by agitating the milk with a whisk and introducing bubbles through this agitation. These come in both electric and hand-powered varieties. These usually don't heat the milk. This means that you get to control the temperature of the process on your own, but it adds an additional step if you don't want cold foam. Because I know you might be tempted to, check out our guide Can you microwave milk? While using these devices is pretty easy, you can't do other things because they need your full attention. They tend to take a couple of minutes to produce a small amount of milk foam. Pitcher-style frothers feature an agitation device in the bottom as well as heating elements. Most modern frothers in this style can froth and heat separately, giving you complete control over temperature. They're also completely automatic, meaning that you're free to do other things while your milk froths. They take between one and seven minutes to work, depending on the amount of milk you're agitating or heating. Typically have a fairly limited capacity which means that you can froth enough milk for a single large cappuccino, but not much more than that. Okay, so what do we recommend? The following products are our top picks for the best milk frothers and warmers on the market. 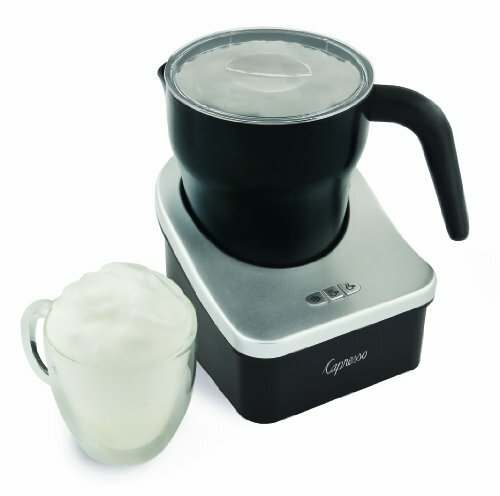 The Secura Automatic Milk Frother makes both hot and cold frothy milk. 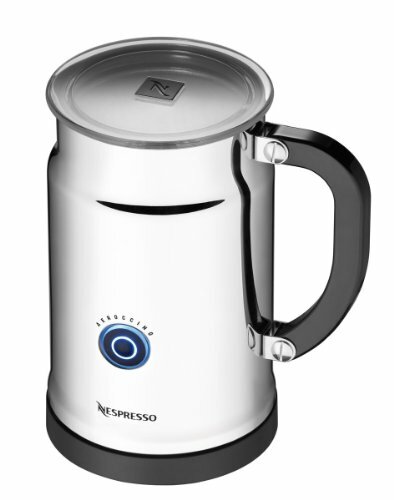 The stainless steel pitcher comes with a detachable base to avoid scorching any wooden table tops in your home. The markings inside the Secura Frother are quite specific, and there is a minimum fill line so you can avoid burning your milk. Be prepared for this tool to get quite hot within the nonstick pitcher. Should you notice any scorching, be aware that there is a free cleaning brush included that will help you clear away any burnt milk protein. Will work with 120v electric plugs as found in the United States. Can prep both hot and cold frothed milk. Press the start button once for hot and twice for cold. Has an auto shut off feature. Holds 125ml of milk for frothing or 250ml for warming. Be aware that even with the detachable base, this tool should not be submerged. Be prepared to let the pitcher soak if needed. If you've only got one coffee drinker in the house, this tool is ideal. For more, be aware that this tool will froth milk in about 45 seconds. The second person in line will not have to wait long! 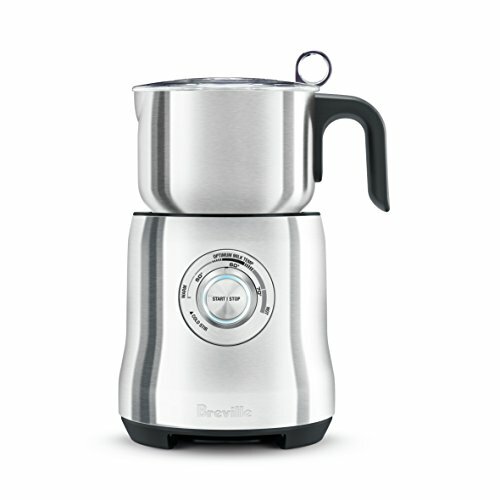 The Breville BMF600XL Milk Cafe Milk Frother offers coffee and hot beverage fans plenty of options. The pot comes with two disks, one for frothing and one for steaming, but both keep the milk moving and prevent scorching. These discs store a magnet on the base of the tool. For larger households, this pitcher is a great choice as it will make up to 3 cups of frothed milk. The heater allows for a temperature variance from 120 to 160 degrees Fahrenheit / 49 to 71 degrees Celsius, so no risk of burning chocolate or other additives. a stainless steel interior and exterior, so it is dishwasher safe. An auto shutoff to avoid bubbly, milky messes. A handle with plenty of clearance to help you keep away from the hot pitcher. It's important to treat the pitcher gently. The frothing discs are held in place inside the pitcher via magnetic force, but if the pitcher gets dinged up the magnets may not seat effectively. Over time, they may be knocked loose during the spinning phase. Easy to clean and use, the Capresso frothPRO 202 Automatic Milk Frother may be a great starting place for making great milk foam in your kitchen. Capresso's unit is one of the easiest automatic frothers to clean featuring removable disks and a dishwasher-safe carafe which is a wonderful contrast to some of the other units in this review. It has two disks and three heat settings to give you complete control over the finished product. It completes a cycle in about two minutes which is not the fastest, but you're free to do other things while you wait. With an 8 oz frothing capacity, this machine can process nearly twice as much milk peruse as some of the other carafe frothers we recommend. It's still not a colossal amount of milk, but you might be able to make two medium cappuccinos with a single use. While Capresso only offers a one-year limited warranty, we're not as worried about this model breaking as we are some others and it’s fairly inexpensive. The Chef's Star MF-2 frother offers multiple settings to create either the perfect addition to a hot beverage or stand-alone hot milk. Also, this tool features a separate frothing whisk at the bottom of the pitcher, so you can simply whisk cold milk as an addition to your coffee. Your Chef's Star frother can heat up to 8 full ounces of milk at one time in under two minutes. If you plan to froth milk, you should only add about 4 ounces to allow for expansion. This product is best for making a single cup of delicious coffee with plenty of froth, but if you've got many lattes or cappuccinos to make, this tool will take some time! Automatic carafe-style frothers have two major downsides: You have limited control over temperature, and they tend to be fairly small. The Aerolatte frother solves both of those issues. Since it's a wand, you can stick it into your own container of milk of any size. This frother places you in charge of heat control. While this is a bit more work, it also lets you heat your milk to the exact temperature you want, when you want to. To clean, Aerolatte recommends that you basically froth soapy water and then give it a rinse. This is a total breeze compared to cleaning any of the carafe units we reviewed. You don't need to fiddle with parts or wipe anything down. 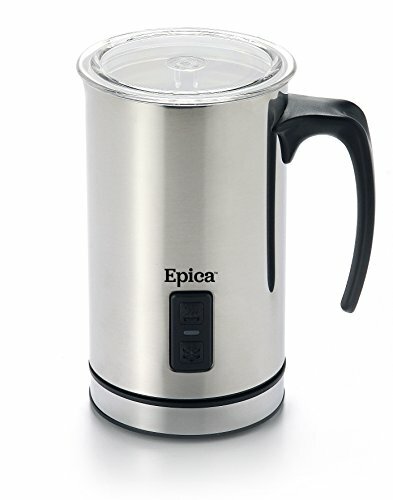 Like other carafe frothers, the Epica milk frother produces a bit more foam per use than you'd need for a large cappuccino and needs to be cleaned between uses. You're not supposed to immerse this unit in water, but cleaning still proves fairly easy, although we prefer the Capresso and Nespresso when it comes to cleaning. The froth that comes out of this unit is thick with small bubbles. There are two heat settings, enabling the production of hot and cold froth. You can vary your foam by temperature manipulation: heat milk before frothing for big bubbles, and run once on cool froth then once on warm froth for rich microfoam. Consider the fat content of your milk as well. Low-fat milk will generate thick, dry foam, while higher fat content will produce a creamier mouthfeel but less dense foam. Epica has included two frothing attachments to give you additional control. This unit is almost totally silent. You're not going to disturb anyone or wake anyone up when you use it, unlike a steam wand. 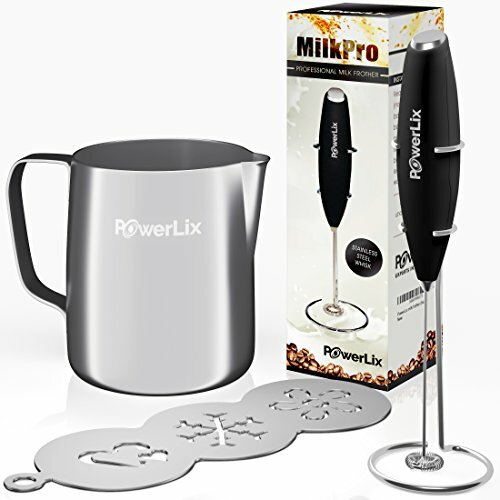 The PowerLix frother is just that: a multipurpose frother that produces plenty of bubbles in cold milk. However, it doesn't heat the milk. If you like your frothed milk to be hot, you'll need to warm the milk before you start frothing. However, if all you're needing is bubbles, this is a great tool with plenty of options. The frother includes patterns that will create custom stamps on the coffee, including hearts, snowflakes, and flowers. The PowerLix comes with its own stand. The whisk is easy to clean stainless with plenty of power, just put in the AA batteries and fire it up. 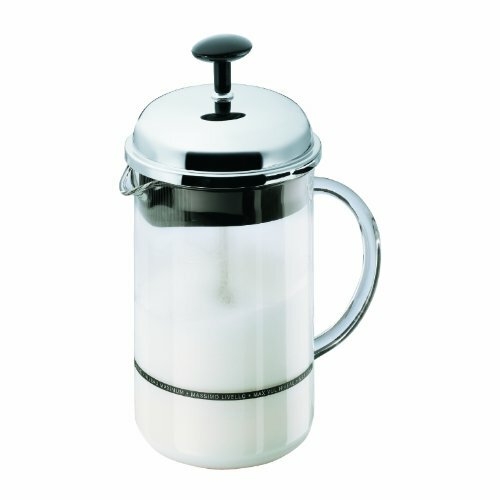 The Bodum milk frother looks a great deal like a French press and functions in much the same way. However, the frothing filter is much finer than the one you'll find on a French press plunger. See our French press reviews for a better comparison. Pour cold, low-fat milk into the frother. Place the cap on the pitcher and rotate the spout to avoid spills. Work the plunger up and down until milk starts to fluff up. Once it's frothed, if you would like warm milk, simply remove the plunger top and place the glass pitcher inside your microwave. It's not fancy, but this frother will work consistently, can't overflow without your notice and is most unlikely to burn. Plus, it's an arm workout! The carafe will take up to 8 ounces of milk for frothing so that you can offer several people a great cup of coffee at the same time. The Bialetti Manual Milk Frother is also ready to help you burn some calories before you drink your coffee! This frother is quite large and has space for three cups of frothed milk. 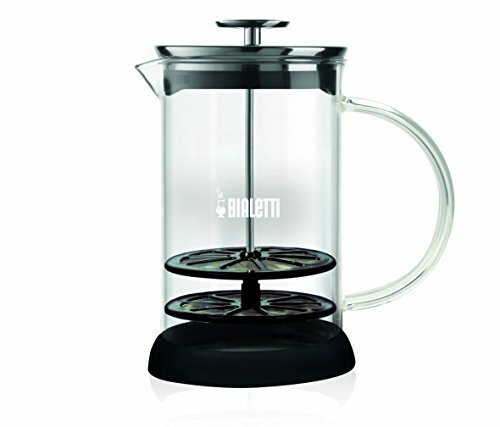 The Bialetti milk frother will also work as a French press. You will need to take care to clean the filters well, but the fine frothing filter will likely make for a very smooth cup of French press coffee so that the cleanup will be worth it! Even though this particular model is discontinued, the Nespresso Aeroccino Plus is highly recommended and may still be available online. While it's not perfect, it does what’s needed for latte and espresso drinks. 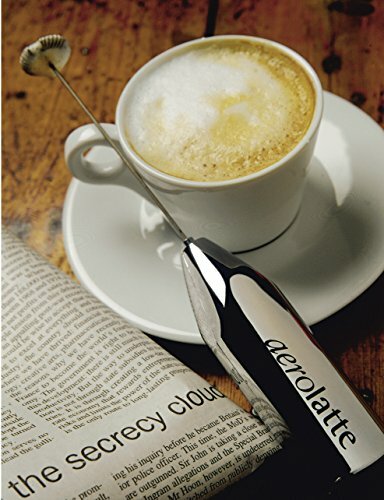 If you need the latest model, check out the Nespresso Aeroccino4 Milk Frother instead. Hot froth in 70 seconds! You will need to clean out this unit in between consecutive uses to prevent build up which could cause spillage during subsequent use. The capacity of this machine is adequate but a little disappointing. While it's really fast, you get enough foam peruse for a single cappuccino. If you're planning on making multiple drinks at once, consider a hand frother, steam wand, or a unit with a bit more interior volume. The froth created by this machine is excellent, and you can literally cut it with a knife. It's also one of the fastest with an operating time of just over a minute. For those who have little patience to wait, this might be one of the better options. The Verismo milk frother makes it easy to create hot or cold froth for your favorite coffee and espresso drinks. This tool features both a whisk attachment and a blending tool that will create plenty of smooth, velvety milk for lattes. The power base, ideal for easy storage, especially if your kitchen is small. 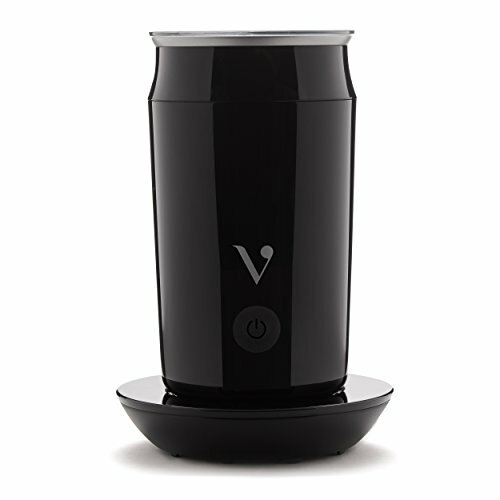 A detachable cup, complete with non-stick interior and easy to clean up. A lid with a plastic insert to keep that frothy milk under control! You can create both hot and cold froth for the beverage of your choice. This is a very sharp-looking tool and would look great beside your Verismo brewing tool. If you love a daily Starbucks but want to enjoy the convenience of rich coffee at home, check out this tool. Even if you aren’t into espresso-based drinks, frothing milk can add a drastic change to your morning cup of coffee. We think the Secura Automatic frother is a great choice for those who want easy preparation with plenty of options, while the Aerolatte may be ideal for those just getting started with creating their own beverages and don’t want all the bells and whistles. We love coffee and are always on the lookout for new tips and ideas. Help out a fellow coffee addict by sharing your thoughts and milk frother experiences in the comments below. We’re eager to hear about your favorite milk steamers and frothers and best tips on how to use them. I have a cheap battery operated hand held stick one (less than $20). A store brand (London Drugs). I’ve had it for years and still is great.